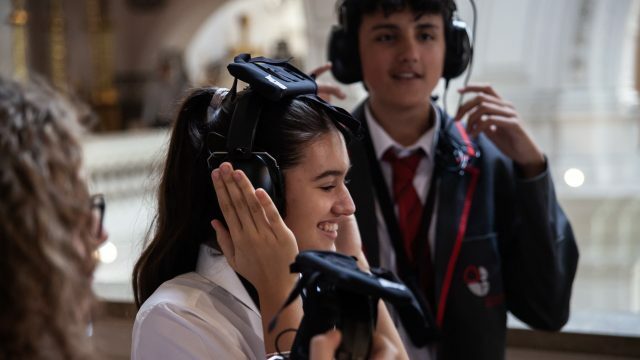 This post was written by Susan Newell, a second-year student on the V&A/RCA MA in History of Design, who works part-time in the V&A’s Ceramics and Glass Department. 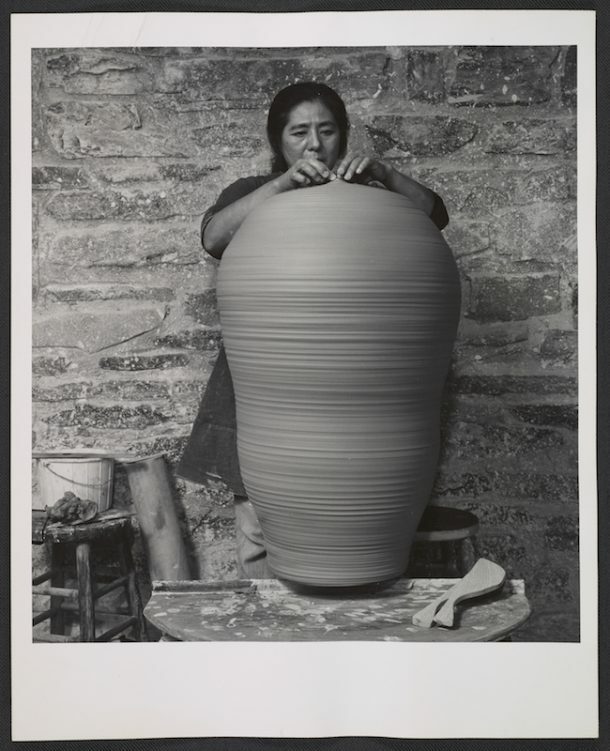 A diminutive woman stands on a spindly ladder next to the enormous pot she is making. She pinches its rim with one hand, deftly wielding a paddle in the other, while her assistants manhandle coils of clay below. Photography and, more especially, film unravel the mystery of objects, allowing us to witness how they were made. In this case, the artist potter Toshiko Takaezu is seen building one of her extraordinary Closed Forms. These were made in marathon sessions up to fourteen hours long using hundreds of pounds of clay. 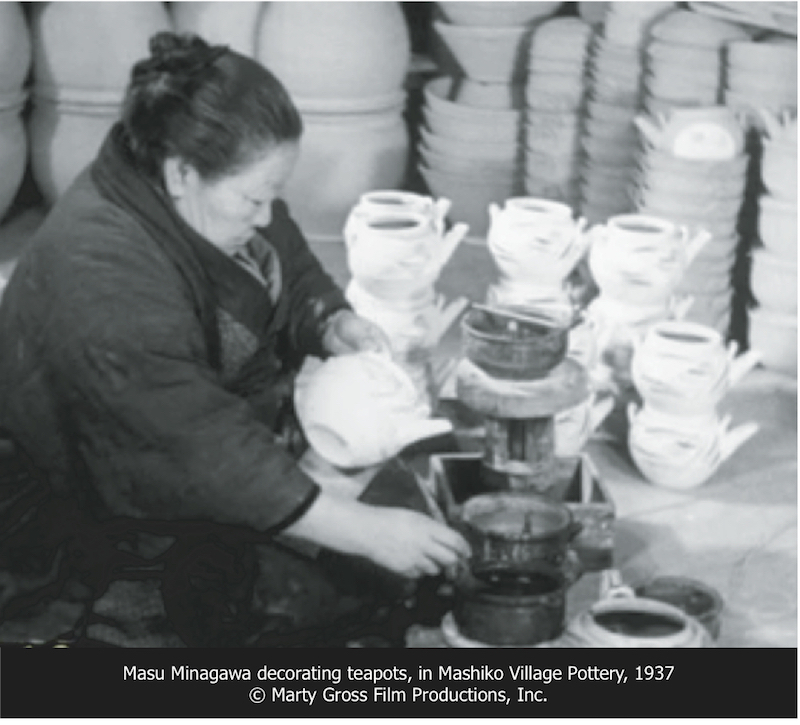 Toshiko Takaezu (1922-2011) was just one of the potters featured in a seminar held at the V&A this summer. The event brought together a wide range of people passionate about pots, including myself and other craftspeople, artists, historians, curators and students. 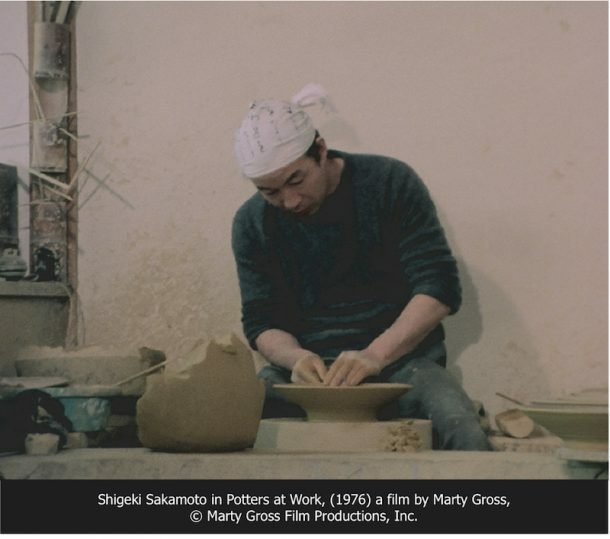 The speakers were American writer Leila Philip, who has made an extensive study of Toshiko Takaezu’s ceramics, and Canadian filmmaker Marty Gross, a specialist in the Japanese folk craft movement ‘Mingei’. 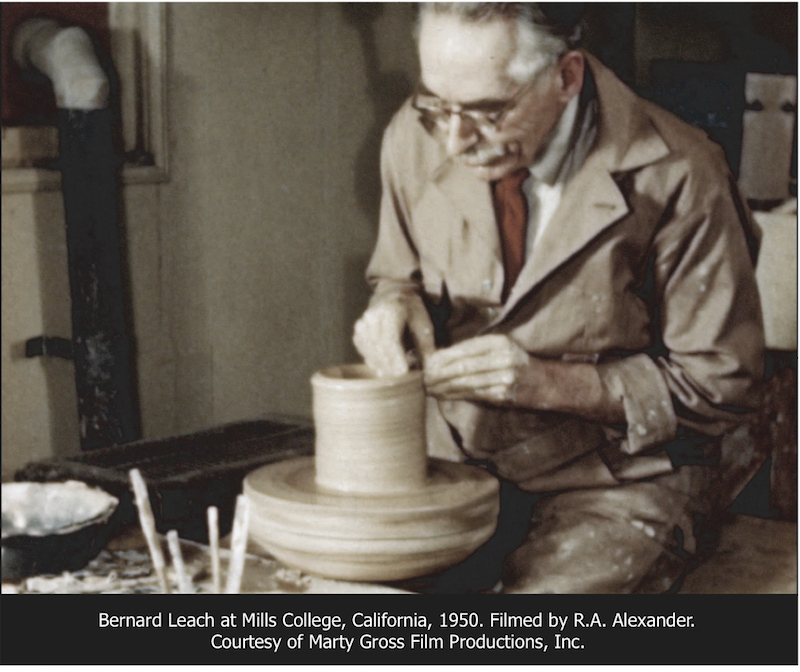 Gross is on a mission to preserve through film a record of the skills that were formerly part of daily life. Following in the footsteps of the celebrated English artist potter Bernard Leach (1887-1979), he went to Japan, where traditional potters worked on a large scale way into the 20th century. 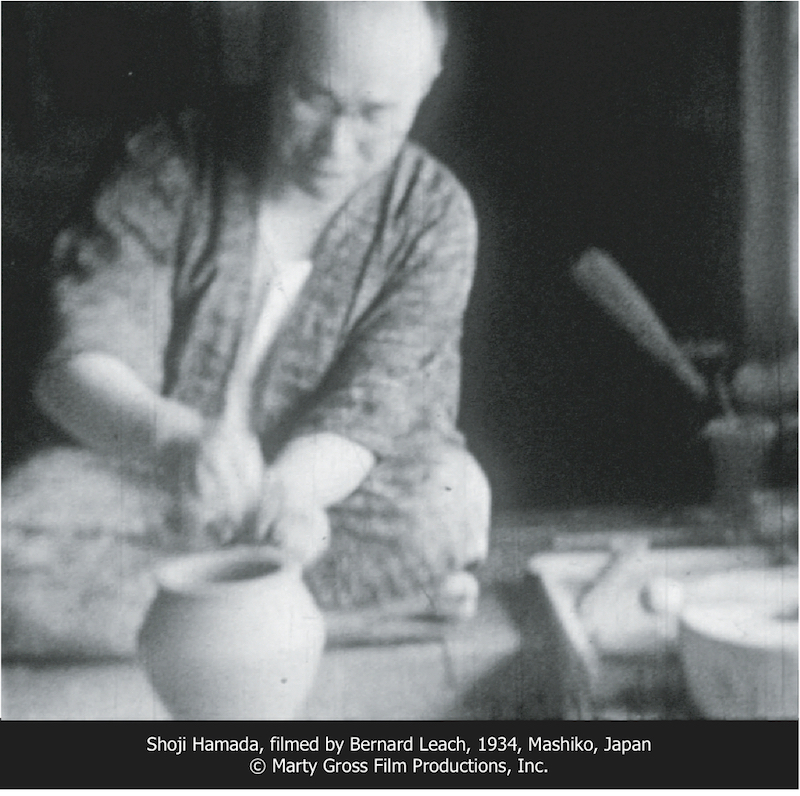 In 1974 he visited England and the Leach Pottery in St Ives, where he enquired about the films Leach made during his Japanese trip of 1934-5. These had miraculously survived and he was given permission to use them in exchange for restoring and copying them. Gross then embarked on a new phase of his career, restoring archival footage (more of which he acquired), and making his own films. 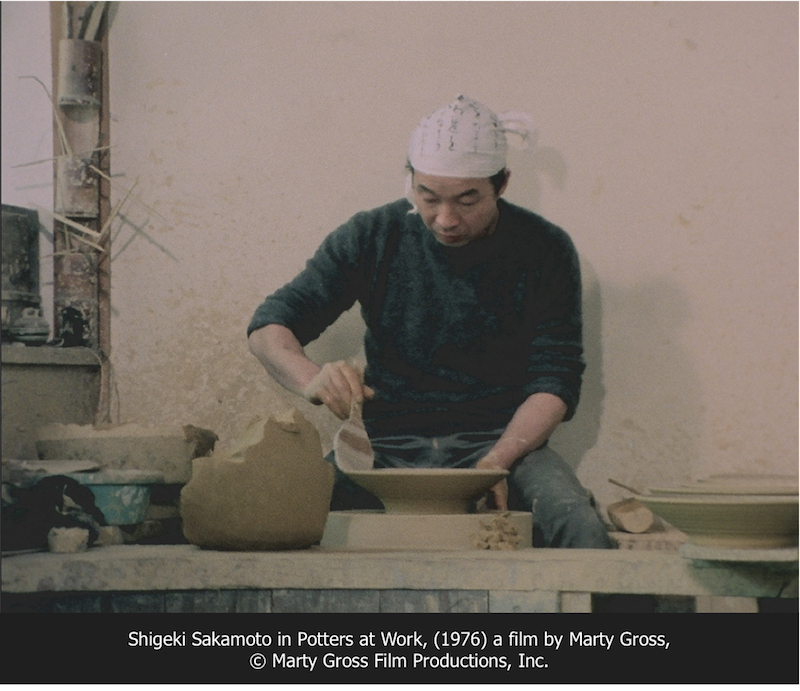 His 1976 film Potters at Work documents every stage of Japanese pottery production, including preparing the clay, pots being thrown, and loading and firing the kilns, allowing us to compare the industry forty years on. The value of these films is undeniable in the context of the decline of the traditional pottery industry, which followed the modernisation of Japanese homes during the 20th century. 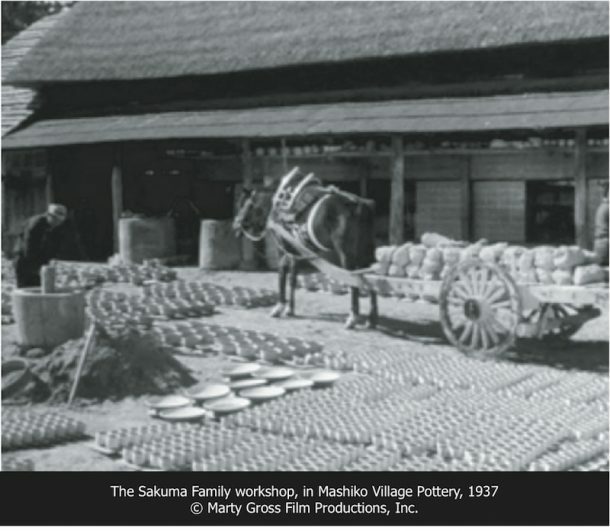 The introduction of gas, piped water and food processing meant that everyday items such as water storage jars, cooking pots and bowls for grinding miso, were no longer needed and many potteries closed. 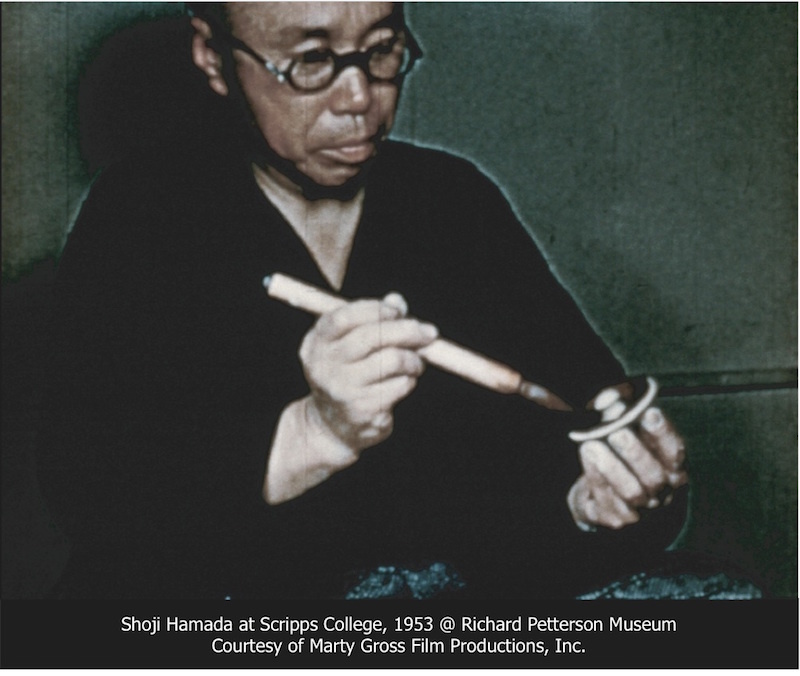 The efforts of philosopher Soetsu Yanagi (1889-1961), founder of the Mingei movement in the 1920s, and celebrated potters, including Shoji Hamada (1894-1978) and his friend Bernard Leach, have meant that hand-made ceramics are nevertheless treasured in Japan today. 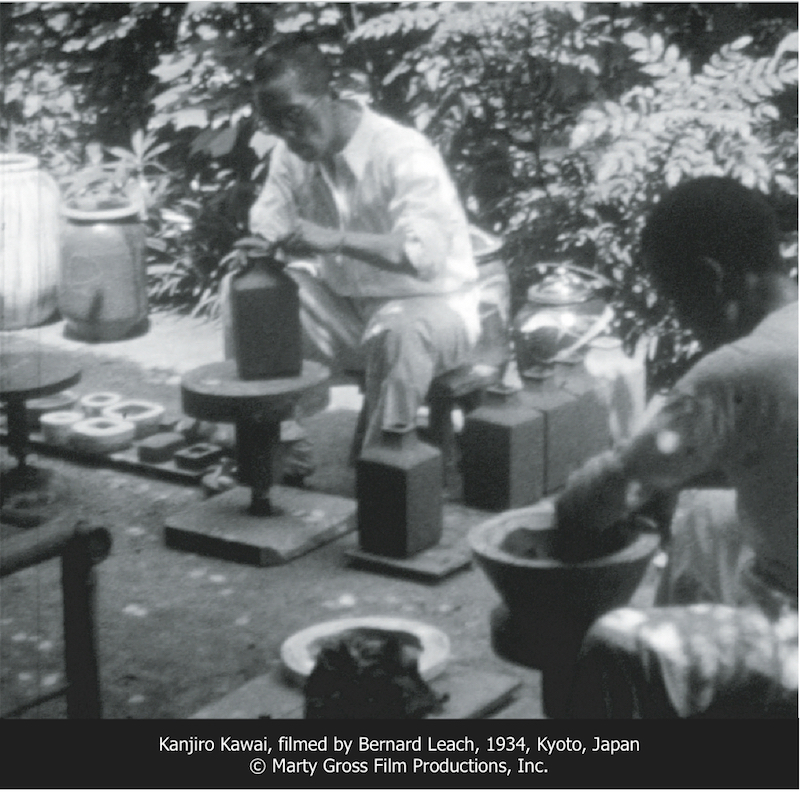 Moreover, their work and ideals inspired the Studio Pottery movement worldwide. 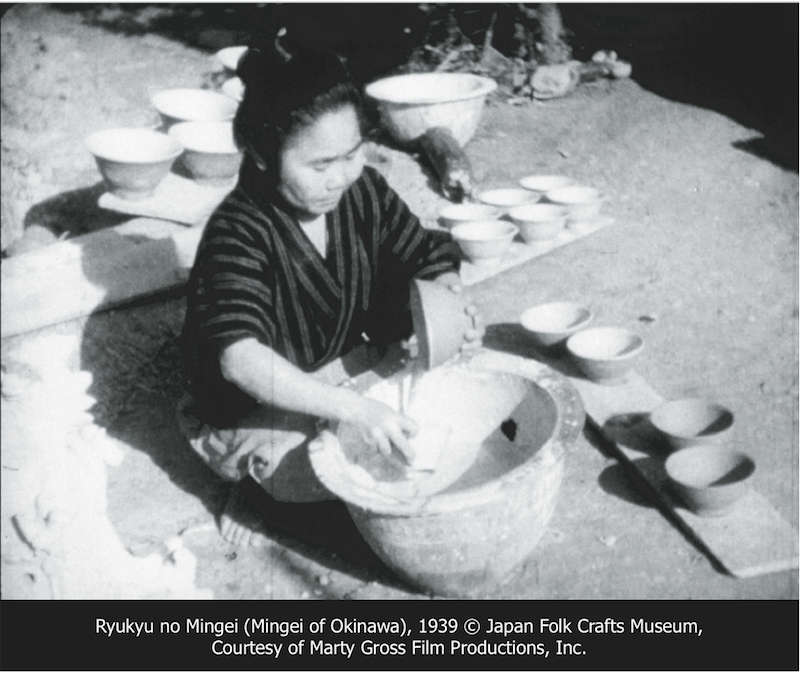 Leila Philip’s presentation introduced the life and work of Japanese-American Toshiko Takaezu (1922-2011). 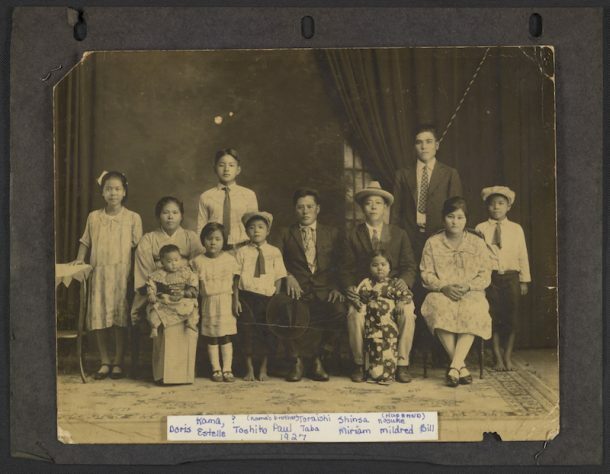 Takaezu grew up in Hawaii in a community of agricultural workers of Japanese ethnicity. During World War II she worked in a ceramics factory where a chance meeting with a US army lieutenant, who was also a sculptor, sparked her interest in the creative possibilities of clay. She went on to study and later teach at the Universities of Honolulu, Cranbrook (Michigan) and Princeton. Her pots embody aspects of her identity and island origins, particularly her painterly use of glazes, which evoke the tones of Hawaii’s landscape. 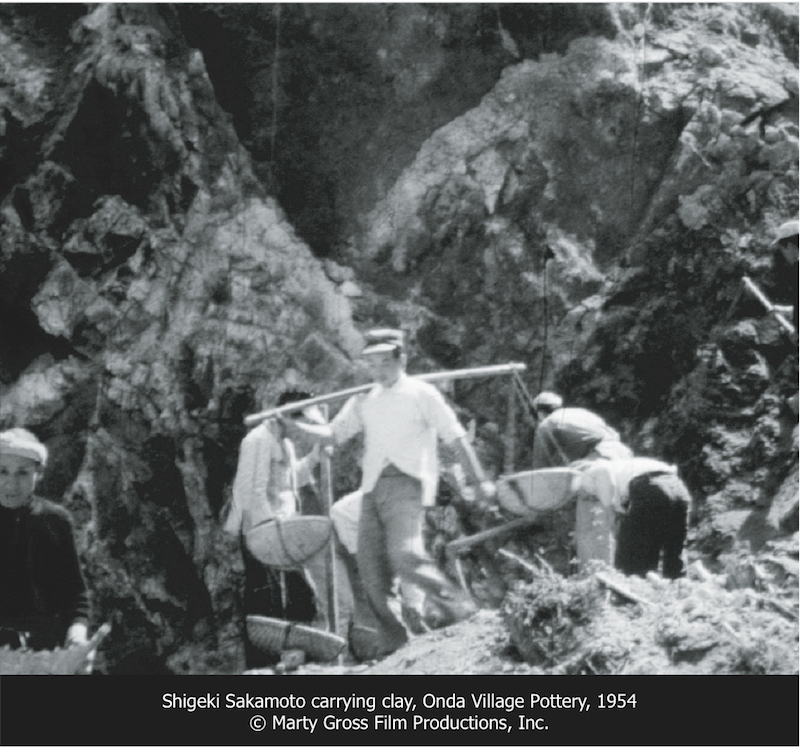 In 1956 Takezu went to Japan for the first time. At this point her story intersects with the world of the films shown by Gross; she visited the potteries in Okinawa (her ancestral homeland), and met Hamada and Yanagi. 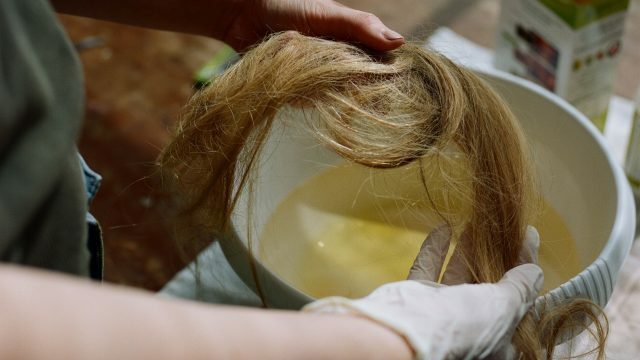 Profoundly influenced by the experience, on her return to the U.S. she began a new phase in her work, including the production of her ‘Closed Forms’. This ‘Dialogue in Clay’ bore witness to the criss-crossings of trans-national journeys, in which creative endeavours speak a global language, linking artists across political and geographical boundaries, time and seas. Dialogues in Clay was organised by Dr Christine Guth, Senior Tutor on the V&A/RCA History of Design Postgraduate Programme. 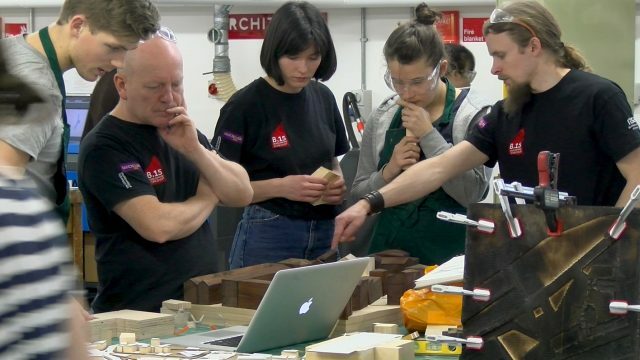 To see what else V&A/RCA History of Design students have been up to, read our other blog posts, including another post by Susan Newell, check out our pages on the RCA website and take a look at Un-Making Things, the student-run online platform for all things design history and material culture. I am managing editor of the V&A Online Journal.